Figure 4. Change in average annual values of main hydrological parameters under different scenarios by 2050 against the baseline (2008) in mm. The current research applied one of the hydrological modeling tools, Soil and Water Assessment Tool (SWAT) integrated as an extension (Winchell et al. 2010) into ArcGIS environment to simulate hydrological processes and investigate water supply dynamics under different scenarios. The model gained worldwide recognition and was tested in many similar studies. SWAT is a physically-based model operating on daily time-step, capable of predicting an impact of land use and climate change on water quantity and quality, simulating water budget in large complex watersheds (Arnold et al. 2012). It allows complex geospatial analysis of a variety of hydrological parameters, such as precipitation and snowmelt, surface runoff and infiltration, evapotranspiration and groundflow processes. Therefore SWAT has found numerous applications in analysis of water supply constraints in spatially-explicit areas and basin-scale water security assessments (Gassman et al. 2007). The main advantage of SWAT is the capability to run simulations for large watersheds without extensive monitoring data and the capacity to predict changes in hydrological parameters under different management practices and physical environmental factors (Gassman et al. 2007; Daloglu et al. 2014). The efficiency of the SWAT against other modeling tools in continuous simulations in large-scale watersheds for predictions of flow under various climatic conditions was proven by many comparative studies (Borah and Bera 2003, 2004; Vigerstol and Aukema 2011; Heo et al. 2015; Liu et al. 2015). Simulation in the model is processed for multiple subbasins, which are divided into hydrologic response units (HRUs). In order to define these units, the input data on land use, management, and soil characteristics should be included. Subbasins have geographic position in the watershed and are spatially related to each other, while the HRU is not identified spatially, as it only represents the percentage of the subbasin area (Gassman et al. 2007). However linkage of HRUs to the subbasins with specific water flow and sediment yields allows for continuous modeling of water quality and streamflow generation (Haverkamp et al. 2005). The ArcSWAT interface (Winchell et al. 2007) enables developing the model consequently loading required datasets on elevation, land use and weather, which are compatible with ArcGIS. 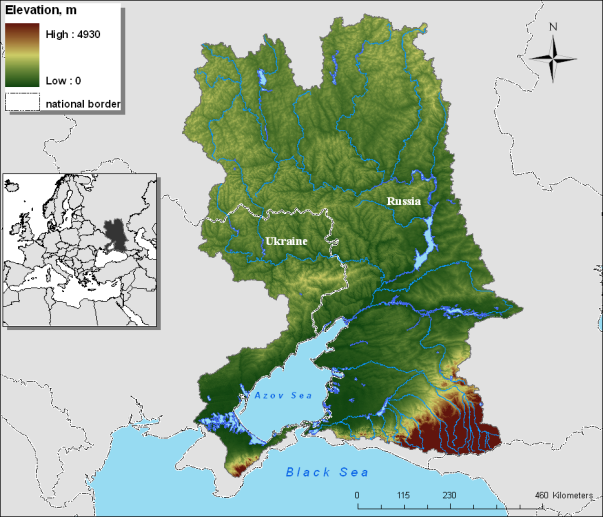 The research focused on the Azov Basin, located in the southern part of Eastern Europe and representing a unique and important watershed in the Black Sea Catchment (Figure 1). Shared by Russia and Ukraine, the Basin is one of the most productive and utilized areas featuring highly-developed agriculture and industry. The basin supports the well-being of more than 30 million people and covers more than 20 administrative units of Russia and Ukraine (RMNR 2010). High seasonal and annual variations of freshwater runoff, mainly depending on weather conditions, cause unstable freshwater supply in the region (Borysova et al. 2005). 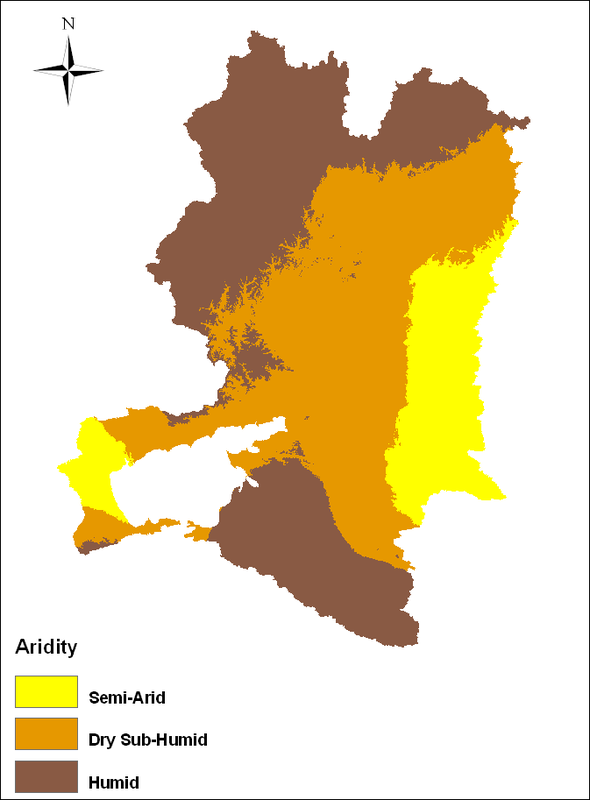 Low precipitation rates and relatively high aridity (Figure 2a and Figure 2b) in the entire basin make this area vulnerable to droughts and desertification (Dronin and Kirilenko 2010). The Azov Basin is one of the representative examples of irreversible ecosystem changes and significant water redistribution caused by rapid economic development in twentieth century, which drastically impacted regional water security. In order to ensure regular water supply and support the various services, such as transportation and hydropower generation, a number of dams and reservoirs were constructed in the area. Along with intensive economic development, construction of power plants and industrial facilities, it has brought significant changes to the Azov Basin, which led to a decrease in freshwater supply to the Sea by one third (Lagutov and Lagutov 2010). The current study investigates the change of water supply in the Azov Basin, in particular in the Tsimlyansk reservoir under different land use and climate change scenarios by 2050. Freshwater supply is one of the major provisional services with the most significant contribution of the Don River. Due to high seasonal and annual variability in water flow depending mainly on climate conditions the water supply in the region can be defined as unstable. Increasing demand for freshwater associated with economic growth and demography changes along with ongoing projects planning associated with additional water extraction may threaten an adequate freshwater supply in the region in the near future. For instance, Rosatom reported commissioning of additional power units at the Rostov Nuclear Plant, which will require additional water withdrawal from the Tsimlyansk reservoir (Rosatom 2013). Anticipated climate change impacts add up further challenges in developing regional water management and security strategies. This research is aimed to provide an assessment of change in stream flow generation in the Upper Don River, the main tributary in the Basin, supplying a major part of the inflow into the Tsimlyansk reservoir and playing important role in the reservoir maintenance (Figure 3). The reservoir provides fresh water for around 457.5 thousand people in the area, supplies 156.8 thousand hectares of farmland and 37.2 hectares of forests and allows maintenance of numerous significant economic facilities such as Tsimlyansk hydropower plant, fish factories, hunting farms, fishing companies and wildlife reserves (Sharvak et al. 2010). The streamflow was selected as the main parameter for evaluation, as availability of measurement tools and observed data makes it relatively straightforward (Srinivasan et al. 1998). Possible decrease in the Tsimlyansk water level will have a significant impact on the basin national economies and well-being of regional communities. To assess the changes in water influx to the reservoir the catchment encompassing upper streams of the Don River with an outlet at the confluence of the river with the Tsimlyansk reservoir was selected for analysis. Spatially-explicit scenarios of climate and land cover changes using datasets of the EnviroGRIDs project were used for assessing water security threats using the SWAT model. Scenarios were built based on outputs of the Metronamica model, which allows assessing spatial development in the land use depending on external factors and policy measures (RIKS 2005). The scenarios were based on the storylines proposed by IPCC-SRES (Nakicenovic et al. 2000) corresponding to the different ways of global socio-economic development. Ultimately, four land use scenarios were formulated and analysed: BS HOT, BS ALONE, BS COOP and BS COOL. BS HOT corresponds to the IPCC’s A1FI scenarios (fossil intensive), when environmental issues are not the main concern. BS COOP refers to the B1 climate scenarios, with strong cooperation and high environmental concerns. The BS ALONE corresponds to A2 scenario with high economic growth and high environmental pressure, and BS COOL corresponds to B2 scenario with strengthening of the local bodies implementing strategies to promote local sustainable development. To develop datasets on weather conditions in correspondence with the land use change scenarios the stochastic weather generator Long Ashton Research Station Weather Generator (LARS-WG) simulating time-series of daily weather at a single station was used (Semenov and Stratonovitch 2010). The scenarios were tested to simulate hydrological processes under different climate conditions and management strategies, providing the baseline for the water supply change assessment. 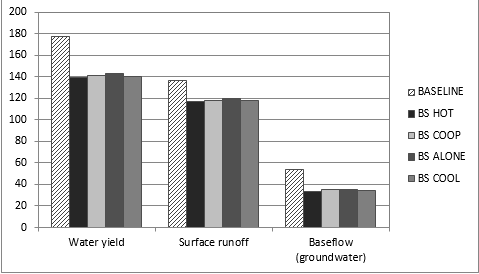 In order to investigate water supply changes, three different parameters were investigated: water yield (the water that remains for surface runoff and base flow after subtraction of evapotranspiration), base flow (groundwater) and surface runoff (water flows occurring the rate of water application to the ground surface exceeds the rate of infiltration). SWAT model output analysis showed that according to all scenarios the annual water yield, base flow and surface runoff in the Upper Don River sub-catchment is envisaged to decrease by 2050, and as a result the water supply in the Tsimlyansk reservoir will be reduced. The change of annual average of the main hydrological parameters by 2050 against the baseline (2008) is shown in Figure 4. BS HOT. 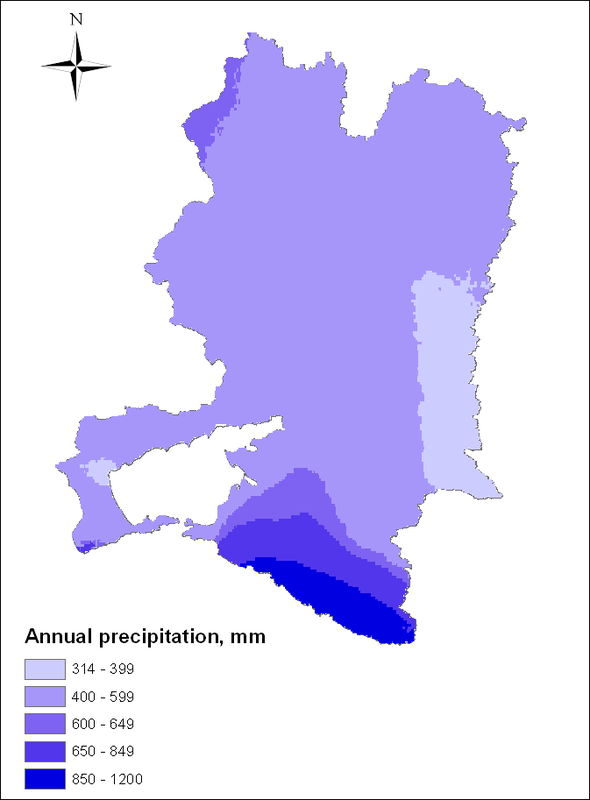 In this scenario the water yield decreases by almost 22%, which is greater than in all other scenarios with the highest decrease of precipitation. The base flow decreases as well while evapotranspiration and potential evapotranspiration increases by 4% and 6% correspondingly. As a result the average annual inflow into the Tsimlyansk reservoir will have decreased by 30% by 2050. BS COOL. Under this scenario the water yield will decrease by 20%, however base flow will not decrease as much as under other scenarios. Surface runoff will decline by 13%, less than in BS HOT, which can be explained by a growth of the forests and shrublands area according to the land use change scenario. Nevertheless, higher evapotranspiration rates and relatively lower precipitation rates will lead to a decrease in the average annual inflow into the Tsimlyansk reservoir by 36% by 2050. BS ALONE. Under this scenario runoff will decrease, but less than under other scenarios (12%). This can be explained not only by relatively high precipitation rates, but also by increase of barren and sparse vegetation according to the land use change scenario. The average annual inflow into the reservoir will decline by 28% in 2050, which is the smallest decrease among all scenarios. BS COOP. Under this scenario runoff will increase that can be explained by increase of barren and sparse vegetation. However groundwater flow will decrease less than in other scenarios, which can be explained by an increase of forests and shrublands by 2050 according to the land use change scenario. In this case water content in soil may increase, while surface runoff will decrease (14%). As a result the average annual inflow into the Tsimlyansk reservoir will decrease by 36% by 2050. The scenario analysis shows that the forecasted regional water strategies coupled with anticipated climate changes will impose a threat to water security and will be a limiting factor in the regional development. Construction of a new transportation canal, maintenance of additional power units at the Rostov nuclear power plant and development of other water-demanding industries will require additional water withdrawal, which currently relies on the existing water supply trends, hence it may significantly escalate water crisis in the region in case of climate and land use change. In order to develop the long-term regional strategy on water security it is necessary to make an assessment of the future water supply changes based on the potential changes in demography, land use and climate condition in the next decades. The results of this project provided useful information of current and future status of water supply in the Azov Sea Basin to support decision makers to meet the challenges posed by water scarcity and climate. The methodology that was developed is fully transferable to other regions of the world in the future. The GIS databases for Azov Sea basin, which have been developed in the current research, can be used for further regional water security studies, using alternative methods and techniques. Further improvement can be made by feeding the model with data of better quality and coverage, further calibration and adding additional parameters such as crop rotation and agricultural management practices. The resulting tools and data will allow analysis of the water security pressures in the Basin and their impacts on human and ecosystem well‐being by local decision makers. This research focused mainly on water supply change in the Azov Basin under different scenarios by 2050 using SWAT modeling tool. There are numerous plans for regional development relying on the current water resources provided by the existing multipurpose water management scheme and its main component, the Tsimlyansk reservoir. The plans include construction of a new shipping canal, launching additional power units at the Rostov nuclear power plant and water dependent industries. Foreseen decrease in water streamflow will significantly undermine capacity of the reservoir to support existing water-dependent sectors of economy and provision of freshwater to local population. New projects associated with additional water withdrawal might considerably threaten water security in the region, which needs to be taken into account while developing the regional water management strategies. In particular, new water extraction limits from the reservoir should be defined and projects on alternative canal construction should be revised. Considering the lack of long-term monitoring data in the region and insufficient number of studies carried out in the area (reference), modeling approach is very helpful. Recognizing both the potential and the limitations of hydrological models and critically evaluating the modelling results, it can be concluded that ArcSWAT is a powerful framework for hydrological processes simulation and assessment of water supply changes. Therefore it may serve as an effective baseline for water security assessment. However, it should be emphasized that the model has several limitations and assumptions that should be considered for enhancement of the assessment results. All environmental models, including SWAT, are simplified representations of reality with the level of uncertainty defined by available data sets and their relevance. Overall, it can be concluded that current research findings may allow decision-makers to assess potential threats to water security in the region. The study was conducted as a part of European FP7 Project EnviroGRIDS “Building Capacity for a Black Sea Catchment Observation and Assessment System supporting Sustainable Development” (EnviroGRIDS 2015). This case study was also based on a Central European University Master's Thesis entitled "Application of SWAT modelling for assessment of ecosystem goods and services in the Azov Sea Basin" by Irina Gilfanova, published July 2012 in Budapest. Sections have been reproduced here with permission of the author. Borah, D. K. and Bera, M. 2003. Watershed-scale hydrologic and nonpoint-source pollution models: Review of mathematical bases. Transactions of the American Society of Agricultural Engineers 46 (6): 1553-1566. ________. 2004. Watershed-scale hydrologic and nonpoint-source pollution models: Review of applications. Transactions of the American Society of Agricultural Engineers 47 (3): 789-803. Borysova, O., Kondakov, A., Paleari, S., Rautalahti-Miettinen, E., Stolberg, F. and Daler, D. Kalmar. 2005. Eutrophication in the Black Sea region; Impact assessment and causal chain analysis. Kalmar, Sweden: University of Kalmar. Dronin, N. and Kirilenko, A. 2008. Climate dependence and food stress in Russia: what if the market transforms as it did during the past century. Climatic Change 86 (1-2): 123-150. Haverkamp, S., Fohrer, N. and Frede, H. 2005. Assessment of the effect of land use patterns on hydrologic landscape functions: a comprehensive GIS-based tool to minimize model uncertainty resulting from spatial aggregation. Lagutov, V. and Lagutov, V. 2010. The Azov ecosystem: resources and threats In Environmental security in watersheds: The Sea of Azov, ed. V. Lagutov, 3-62. Dordecht: Springer. Nakicenovic, N., Alcamo, J., Davis, G., de Vries, B., Fenhann, J., Gaffin, S., Gregory, K., Grübler, A., Jung, T. Y. and Kram, T., La Rovere, E., Michaelis, L., Mori, S., Morita, T., Pepper, W., Pitcher, H., Price, L., Riahi, K., Roehrl, A., Rogner, H.H., Sankovski, A., Schlesinger, M., Shukla, P., Smith, S., Swart, R., van Rooyen, S., Victor, N. and Dadi, Z. 2000. Special Report on emissions scenarios. Cambridge: Cambridge University Press. Quintero, M., Wunder, S. and Estrada, R. D. 2009. For services rendered? 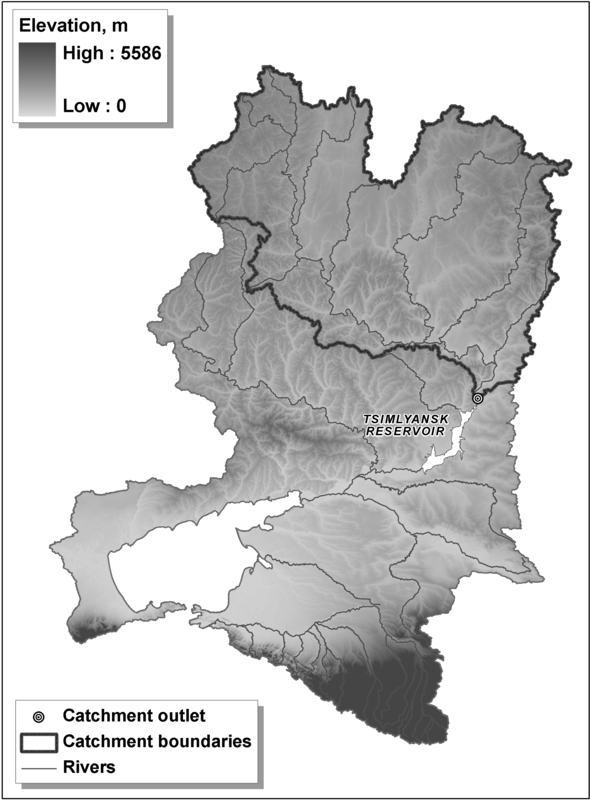 Modeling hydrology and livelihoods in Andean payments for environmental services schemes. Forest Ecology and Management 258 (9): 1871-1880. Research Institute for Knowledge Systems (RIKS). 2005. The Metronamica modelling framework: model descriptions. Model documentation. Maastricht: RIKS. Semenov, M. A. and Stratonovitch, P. 2010. The use of multi-model ensembles from global climate models for impact assessments of climate change. Climate Research 41: 1-14. Sharvak, E., Fesenko, L., Generalenko, I. and Ilyashenko, N. 2010. Multipurpose water scheme assessment of the Tsimlyansk reservoir. In Environmental security in watersheds: The Sea of Azov, ed. V. Lagutov, 107-114. Dordrecht: Springer. Srinivasan, R., Ramanarayanan, T. S., Arnold, J. G. and Bednarz, S. T. 1998. Large Area Hydrologic Modeling and assessment Part I: Model Application. Journal of the American Water Resources Association, 34 (1): 91-101.